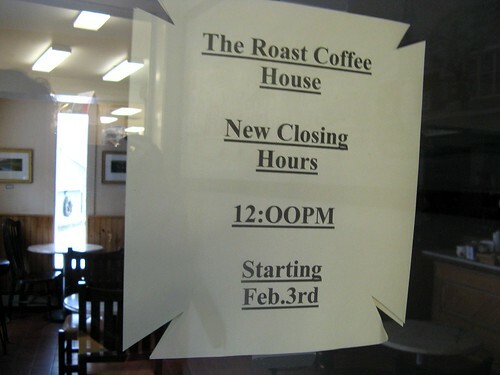 the roast closing early, originally uploaded by jahansell. I've always liked The Roast. I first started going there when my oldest daughter was a baby, and it's always been a great place to socialize - I met my friend Noelle there just before her daughter Ciara and my daughter each turned 1. (When you're a stay at home mom, desperate for any adult interaction, seeing someone with a kid your kid's age is the perfect excuse to strike up a conversation.) Back then The Roast was in Lakeville, and had tables made from slices of tree trunk. We used to play chess there- Abbey would play with the pieces and make the characters have "weddings." The Roast moved to Salisbury, and we followed - in those years, Abbey would take ballet at Arts in Motion, and I'd hang out and sip coffee, chatting with the other ballet moms and dads. Again, the perfect social setting for me. Then, Joe decided to close at 2. Suddenly Salisbury was without an after-school hangout. Disaster! He opened an ice cream shop, but its ambience wasn't nearly as pleasant. Now he's closing at noon - hopefully only for the winter? Doesn't matter to me - I spend my time and drink my coffee at the Country Bistro now. I don't see nearly as many friends there, but I do love their French lentil salad!